There’s just something about New York! I don’t know what it is but there is just a buzz about the place. The streets are super hectic, everyone’s always in a rush and there is a sense of excitement as you wake up each day in the Big Apple. 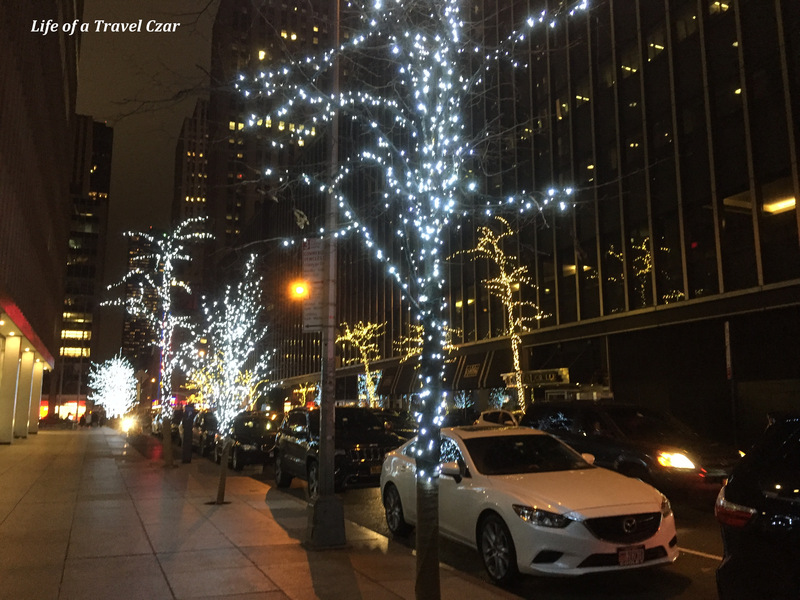 I have enjoyed my stay and have had some really good food and wine, stayed at an amazing hotel and done the sort of things one does when they are in NYC in winter. The skate rink in front of Rockefeller Centre is oh so beautiful, even if you’re not coordinated like myself and can’t skate. 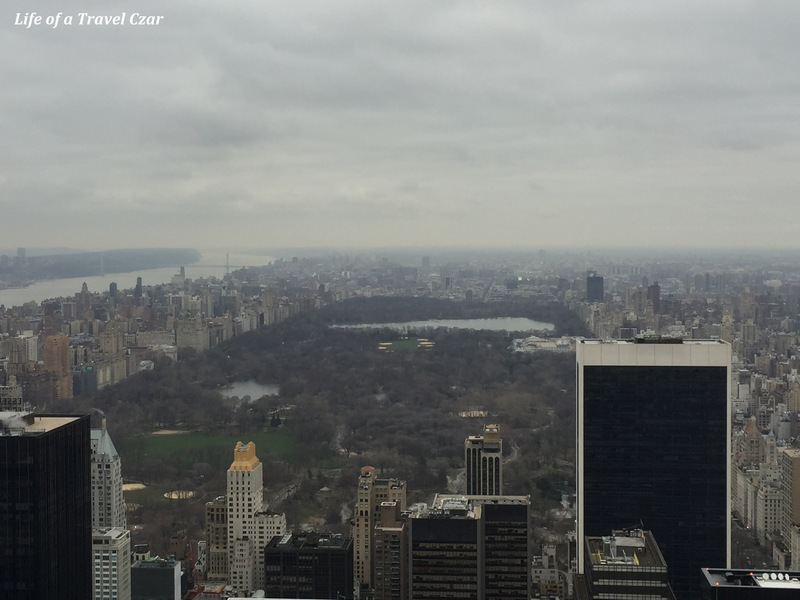 There is something so majestic about the view from the Top of the Rock overlooking Central Park. You feel so small from that moment you peer of the edge and realise how big the city actually is. 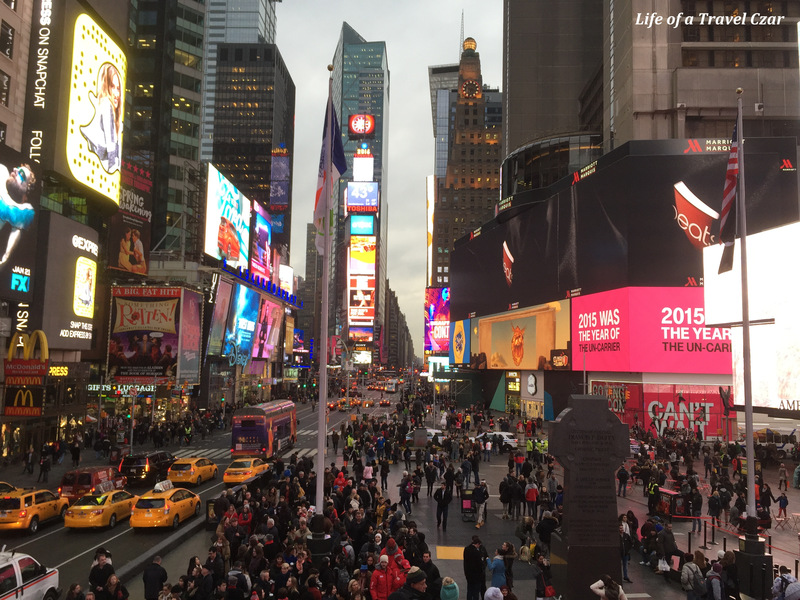 The neon lights of advertising and big brands that just made the USA the country it is today have a somewhat hypnotic glow in Times Square. 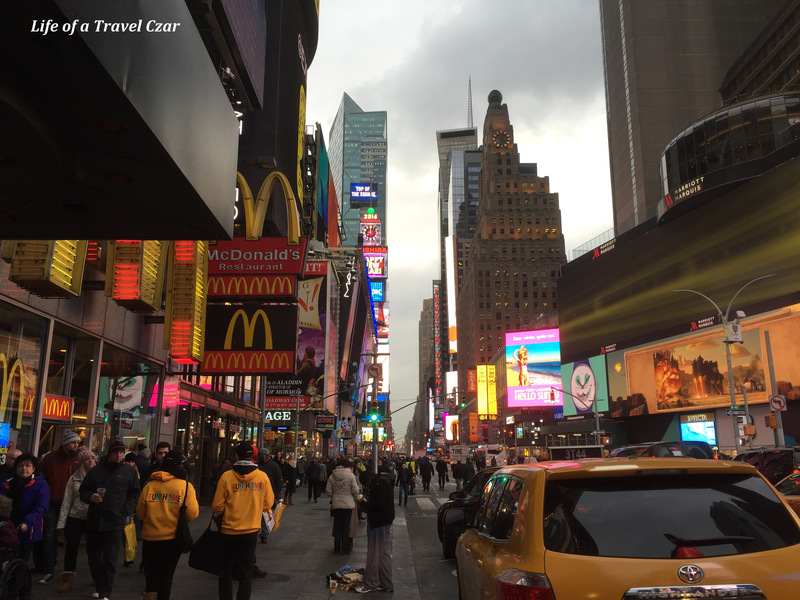 It is a classic snap of the yellow taxis, the busy New Yorkers and the glow of the electronic billboards inviting you to buy a name brand. I could just stare at this place for hours on end without a single thought or reflection entering my mind. If there’s one thing New York does its late night dining. So its my first day in New York and I haven’t eaten, so I venture out in search of some supper. 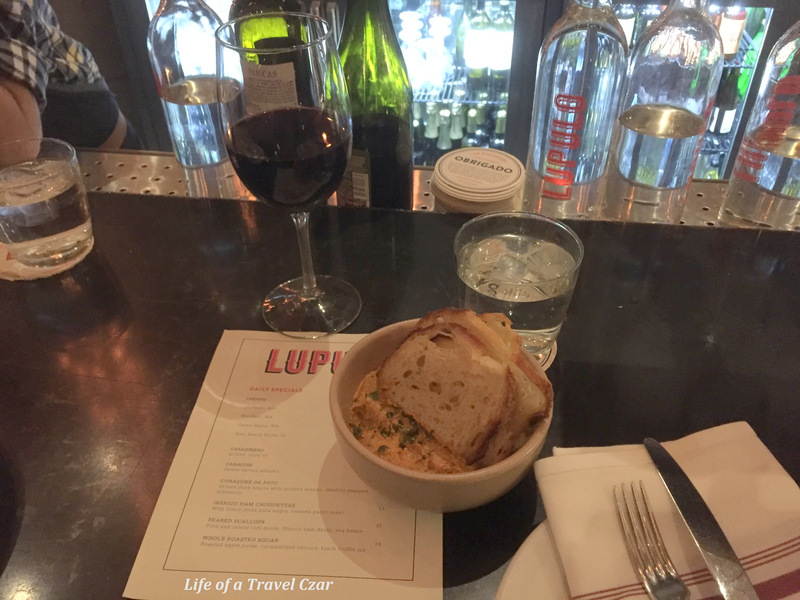 I stumble upon a hip and happening spot called Lupulo. The hosts are super friendly, its packed, there’s a counter for a solo diner and its gonna get me into the NYC mood. The place resembles a bar out of Lisbon with communal atmosphere and good old Portugese cuisine. I park myself on the bar and find myself lost with all the beer being poured, the energy and noise from the staff, the interested selection of wine varietals and of course plenty of cured meats freshly shaved prior to serving. I opt for a glass red and a couple of dishes to satisfy my hunger. The beautiful rustic mackerel spread is creamy, pungent and full of the rich oily mackerel flavour. The crusty bread proves the perfect accompaniment to the dish. 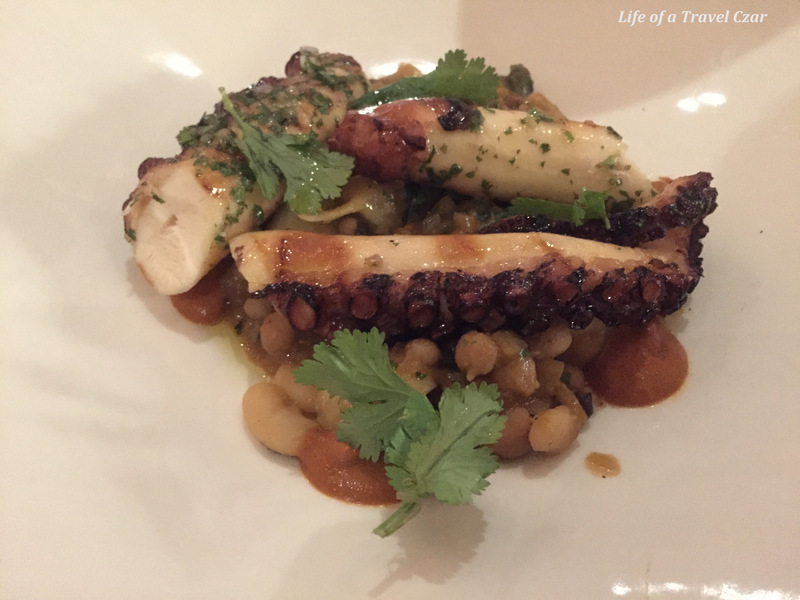 The Octopus is succulent with a smoky charred outside and its distinctive natural flavours. 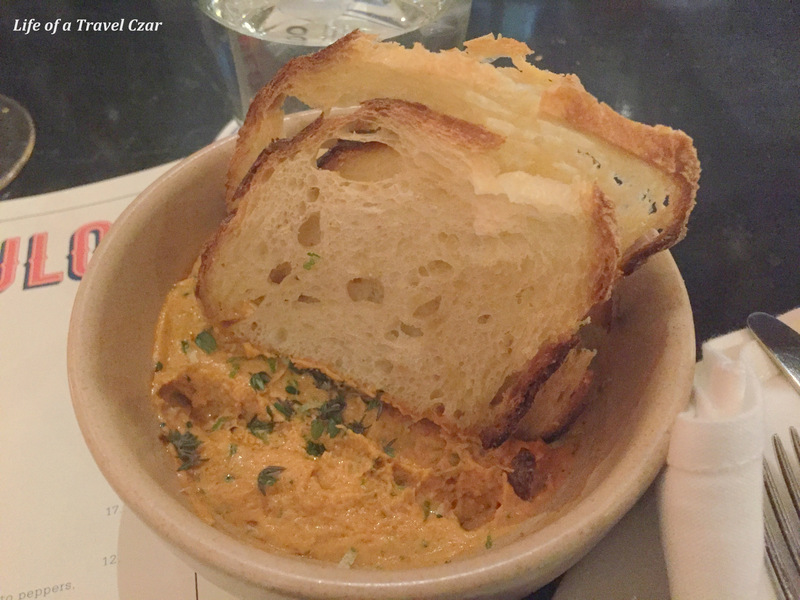 The beans add som nice texture and the rich juiciness of the romesco sauce is a pure delight. A very enjoyable dish indeed. I am seated at the bar next to a guy in technology, we start talking and I tell him I have just jetted in from Sydney. We end up having a great chat about the tech industry and debate whether Marrisa Mayer has what it takes to turn around Yahoo (yeah the weird sort of thing you chat about in at late night dinner). Eventually I am just too tired and the jet lag has kicked in and I need head back to my hotel. A very enjoyable supper indeed. 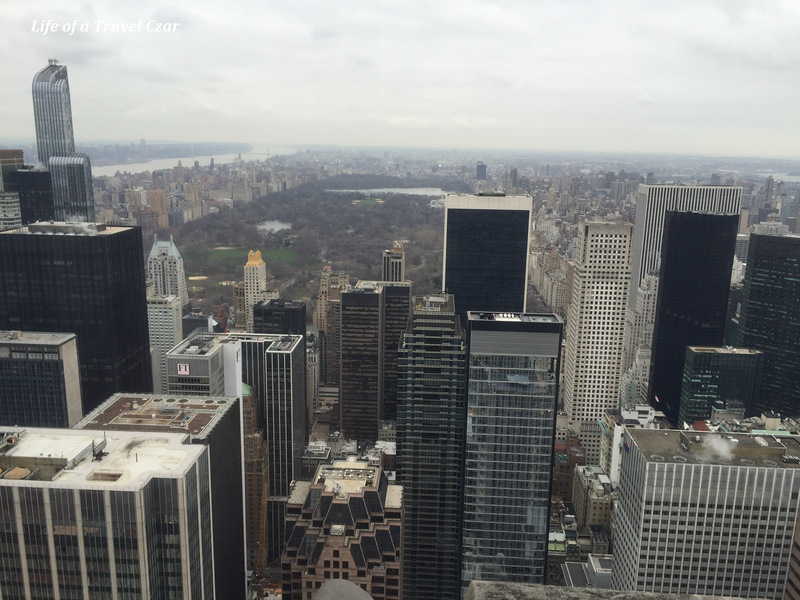 I have a packed few days in New York and finally its my final day in New York…. Life is not about brands and things it’s about people for me! I was so excited to (through social media actually) reconnect with an old friend from Australia. We head for breakfast on my final day in New York. 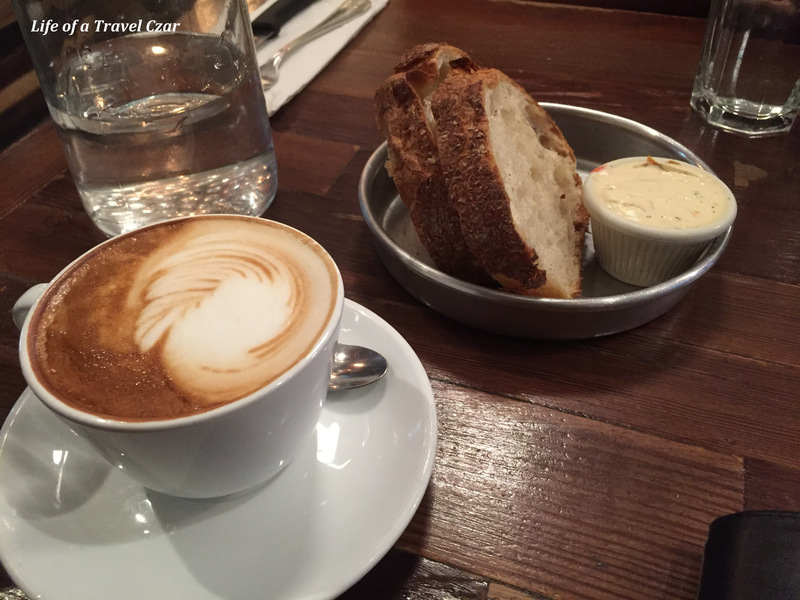 We head to beautiful rustic breakfast spot near my hotel and the food is just amazing. I have a coffee and it is probably best coffee I have had in New York (umm sorry but the USA normally does not do good coffee). So the dish sits on the table for a moment where I gaze at the alluring thick, savoury, spicy, rich dark red tomato ragout with its dance partner “the eggs” peering at me through their baked imprisonment. I slowly mess with the eggs as the softness of the streaky egg white runs through the ragout and cooks a little further. I gently scooped a bit of the egg white, the tomato, and of course the pasty runny yolk which makes for a taste sensation. 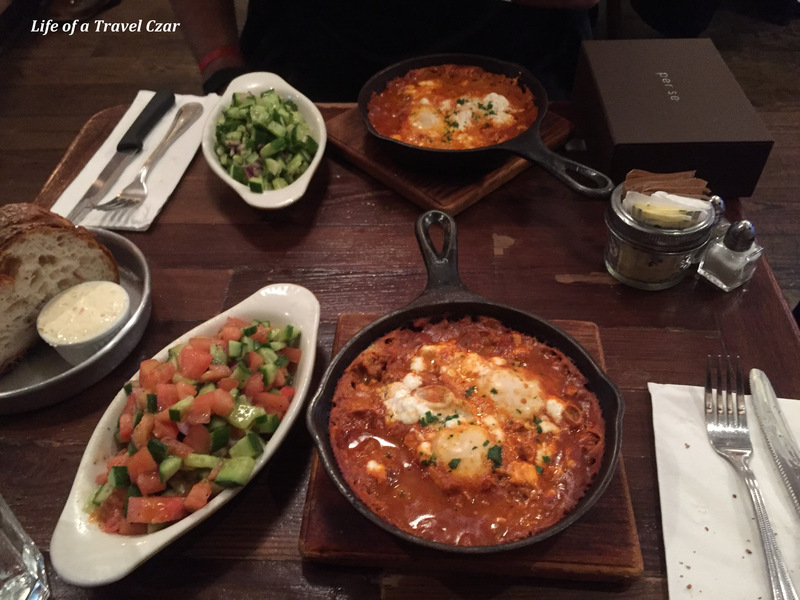 The crunchy chopped vegetables in the Israeli salad are a good mix and give you the impression you’ve being good and healthy. But on the other end of the spectrum we order some home fries (not pictured) which prove to be an excellent comfort food to suit New York’s winter weather. 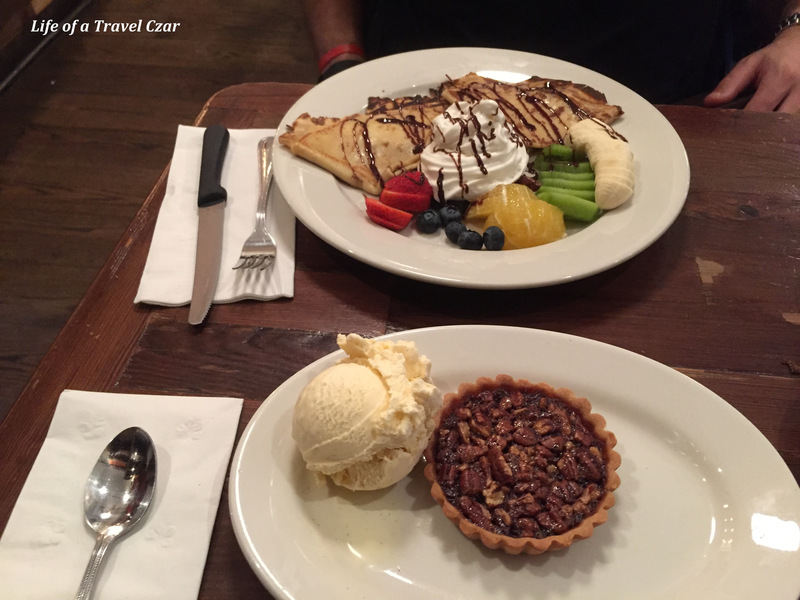 I immediately have food envy when I see the Blintzes (why did I not order that)… I console myself that I am being healthy by ordering the tart – c’mon peacans are nuts and nuts are kinda healthy. Okay I can see you all giving me that look, so I’ll concede my choice wasn’t healthier! I am on holidays, so I kinda get a leave pass on the whole healthy eating thingy. 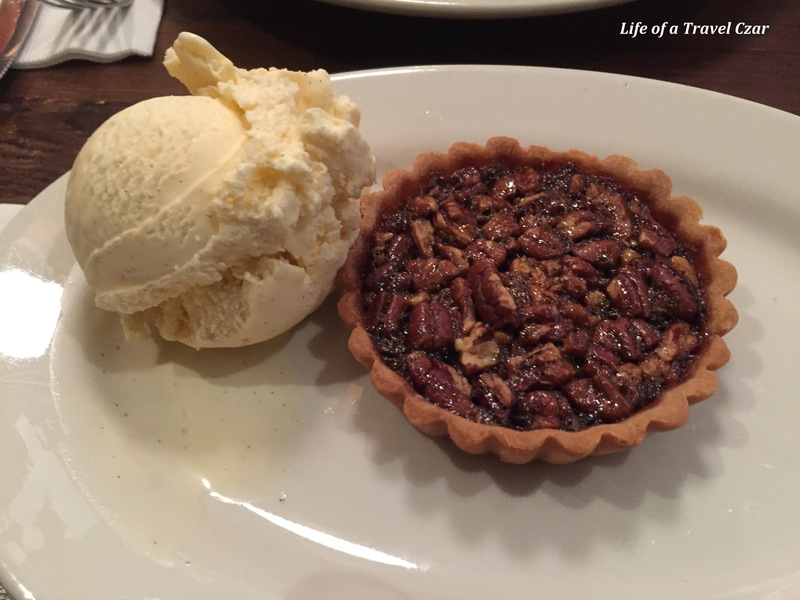 The pecan pie is has the delightful crunch of the pecans, the lovely buttery, gooey, “burnt” caramelised like mixture which is deeply satisfying. Then the biscuity buttery crumble of the pastry which confines the mixture breaks and forms a beautiful texture in my mouth. I just love the experience of eating this tart. A very satisfying experience indeed. Post my breakfast I head-off to Church and then kick-on with some peeps to Gotham West Market. 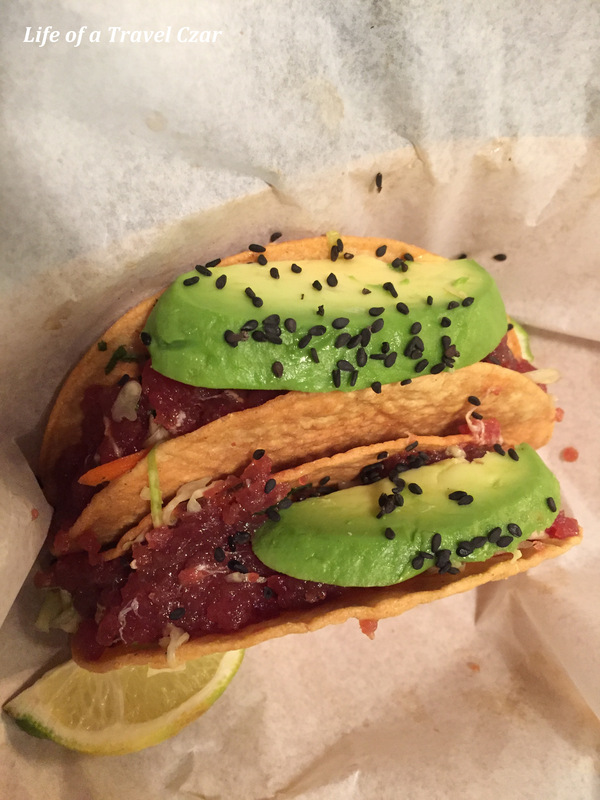 I opt for a bit of Mexican – Tacos are from the folks at Genuine. 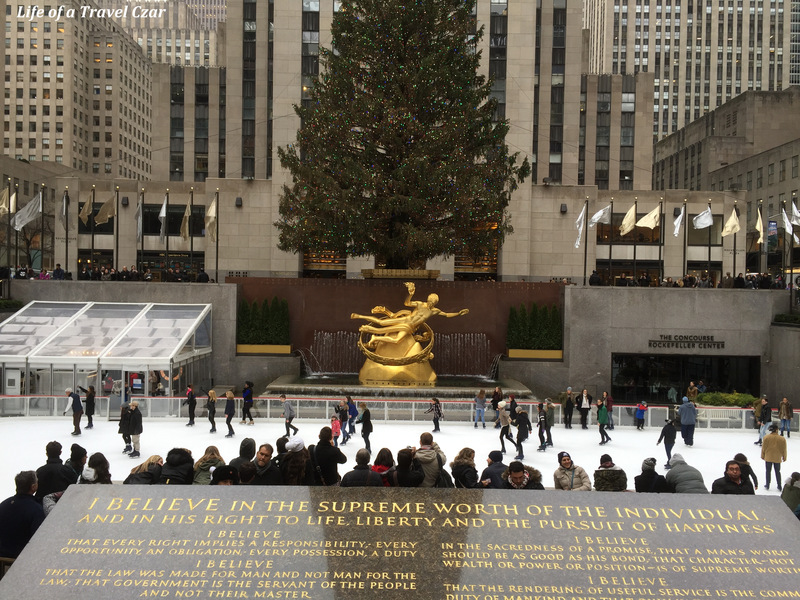 New York – you’re just oh so cool and so beautiful! I will always love you!